The tools of Every Top Producer. This kit is Packed Full of Amazing Sounds and Loops. Achieve a Full sounding Track with these Fundamentals of Production. BUY with Confidence.. All our sounds are of the highest quality available and have been sampled using the best technology in the industry. This is a MUST HAVE for Every Serious Producer. This kit includes: Nearly 1000 Sounds organized into the following folders Bass, Classics, Effects, Extras,Horns, Keys, Pads, and Voice. 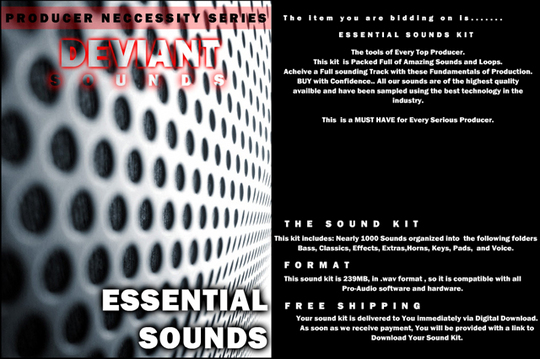 This sound kit is 239MB, in .wav format , so it is compatible with all Pro-Audio software and hardware.